It’s fast – the only bit of effort you need to make is finely chopping an onion so this salad is ready in under 10 minutes, yup now you definitely can’t beat that! It’s fresh and healthy – the lemon juice, zest, fresh basil, and onion all give this salad the most delicious freshness, flavour and it’s packed with protein and is extremely good for you. It can be prepped ahead of time – you can whip it up in advance and enjoy it for lunch on the go or serve it up at barbecues or picnics plus the flavours get a chance to develop! 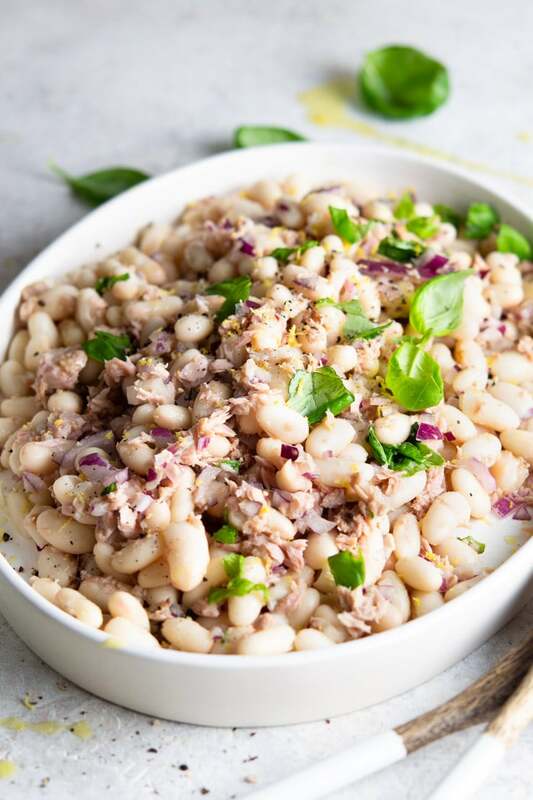 Cannellini beans are my bean of choice, I just love the texture, creaminess and flavour especially if you buy high-quality ones. Whilst living in Italy I came across these white beans sold in jars and not just canned. Once I tried them I could not believe the difference in flavour and texture (so much more creamy and so much more delicious). If you can’t find jarred ones, use higher quality canned ones and don’t go for the cheapest ones. Tip: If you want to switch things up you could also use butter beans but the texture will be slightly different. Drain and rinse the cannellini bean and add to a large mixing bowl (photo 1). Drain the tuna and add that to the bowl alongside finely chopped onion, lemon zest, and juice (photos 2-4). Drizzle over some olive oil and season with salt and pepper, finally add some chopped basil and toss to combine (photos 5 & 6). Super easy, right? There’s no dressing to make, it all just mixes together and tastes incredible. You can also prep this salad in advance and just keep it in the fridge until you need it. Use good quality tuna and make sure it’s from a sustainable source. Quality also goes for the cannellini beans, don’t go for the cheapest as they tend to be harder and not as tasty. Make sure to rinse the cannellini beans before adding to the salad. You can use tuna canned in water or oil. 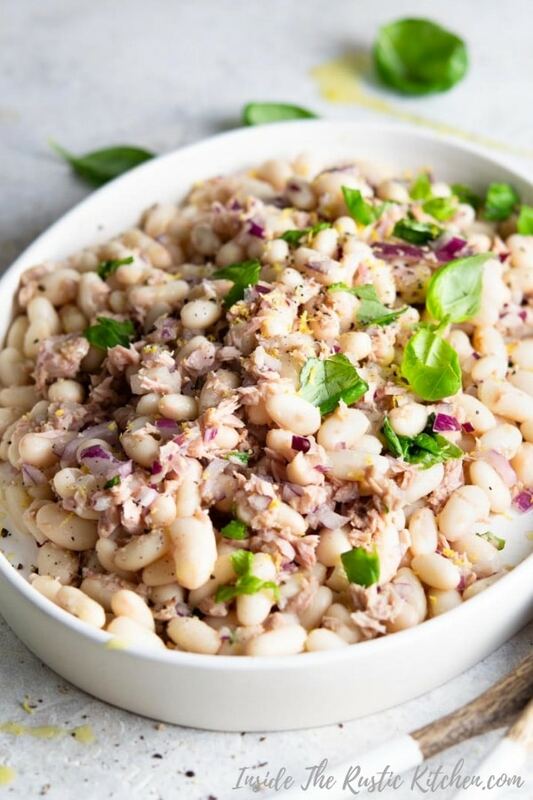 If you’ve tried these Tuna White Bean Salad or any other recipe on the blog then don’t forget to rate the recipe and let me know how you got on in the comments below, I love hearing from you! You can also FOLLOW ME on FACEBOOK, INSTAGRAM and PINTEREST to see more delicious food and what I’m getting up to. 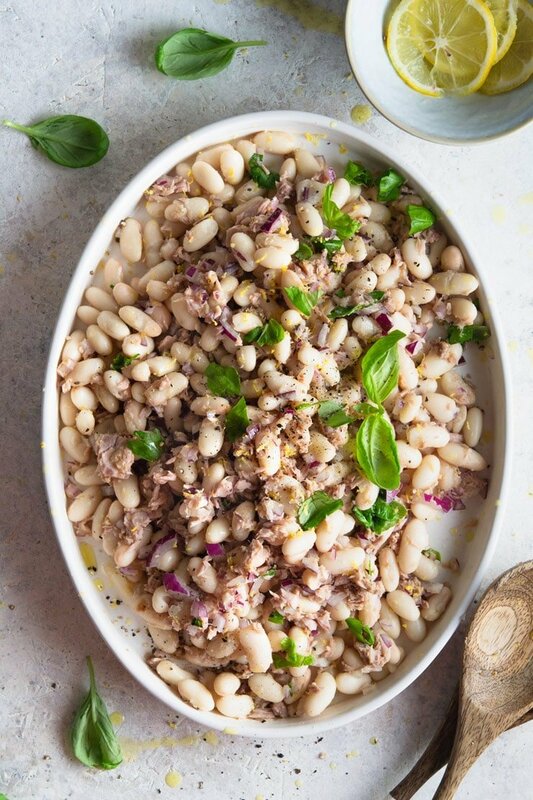 Drain and rinse the cannellini beans and place in a large bowl then drain the tuna and add to the bowl. 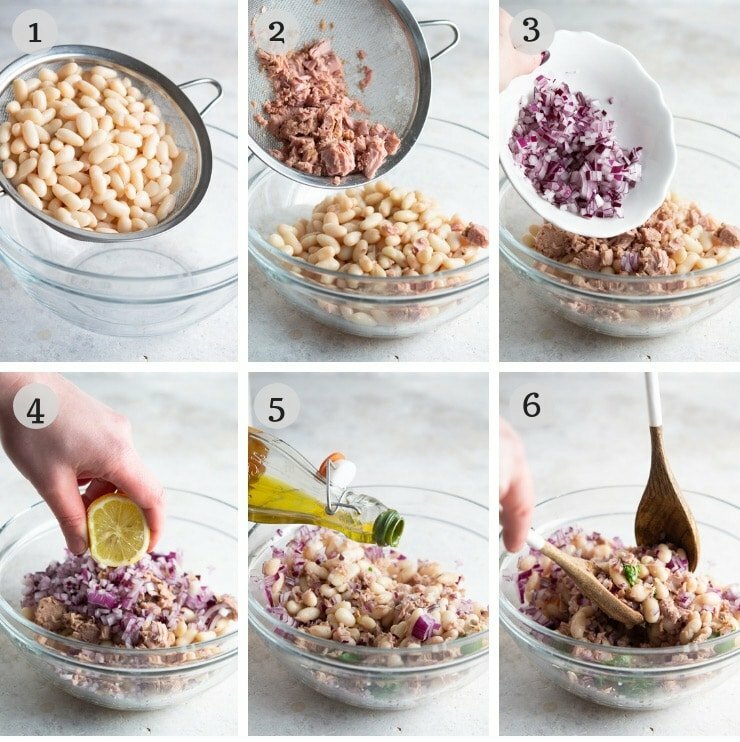 Finely chop the red onion and add to the bowl with the cannellini beans and tuna. Grate the zest of 1 lemon over the tuna and beans then squeeze over the juice of half the lemon. Season with salt and pepper. Finely chop the basil and add to the bowl along with 2-3 tbsp olive oil (add more if desired). Stir everything until combined. Enjoy. Use good quality tuna and make sure it's from a sustainable source. 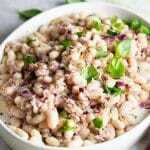 Quality also goes for the cannellini beans, don't go for the cheapest as they tend to be harder and not as tasty. I just love this! So simple but super duper tasty!! It’s so quick and easy too, thanks so much! So simple but absolutely loved it!